I don’t know what’s it like where you live, but in our area herbs are expensive, and it doesn’t matter where you buy them or from whom you buy them. Plan to drop a chunk of change for about 10 leaves of anything that will add flavor to your cooking. That is one of the top reasons why I started growing my own herbs, besides the fact that I just enjoy gardening. Many herbs are pretty easy to grow, and in my view the easiest herbs to grow are the perennials. Plant them once and as long as the weather gods smile on you, they’ll come back year after year. 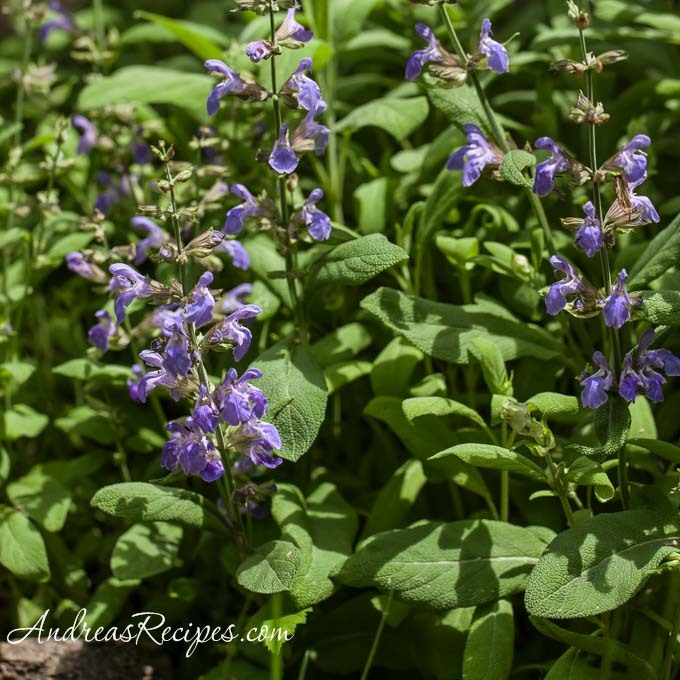 Here are my favorite perennial herbs in our garden. Some are technically annuals that reseed themselves, and that works too. Thyme is a great garden border plant. It grows low to the ground, so you can put it along edges where it’s easy to reach. 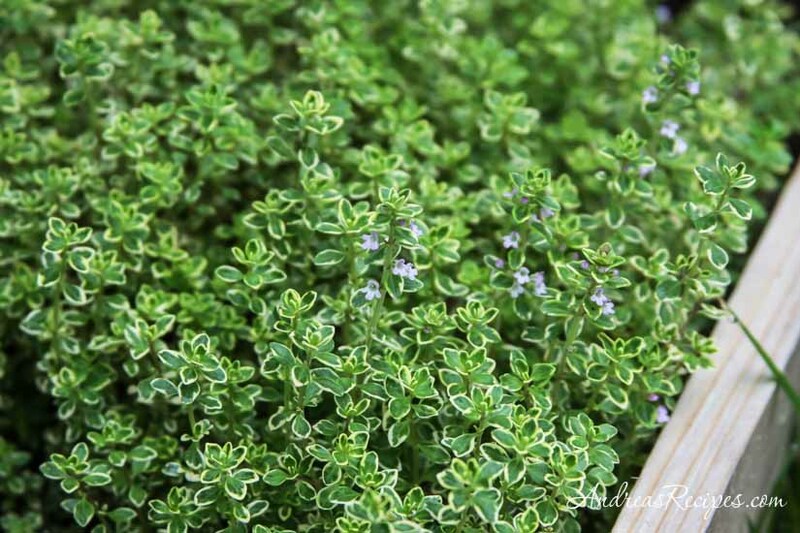 There are many varieties of thyme, and I typically grow German thyme in a couple locations around the garden. It grows quickly and can get very long and woody, so keep it trimmed. 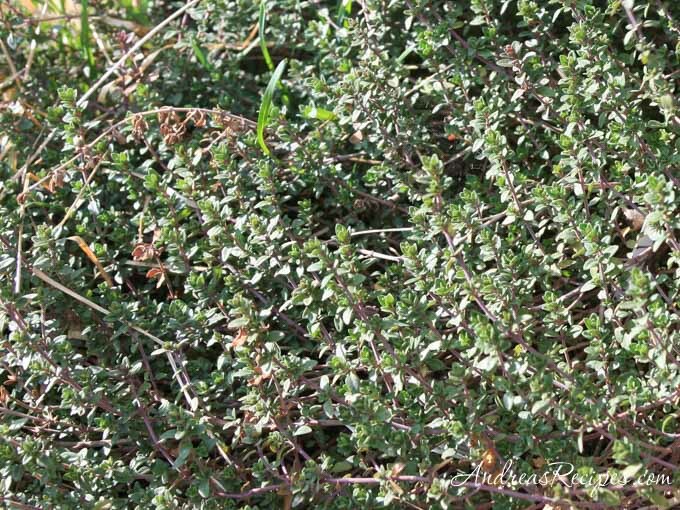 Lemon thyme is a favorite for both savory and sweet cooking. It’s wonderful in cookies and even beverages and sorbet. Plant it in a sunny or mostly sunny spot. Like the English thyme, this needs to be trimmed regularly. Rosemary is one of my favorite herbs for roasting and soups. It’s an evergreen shrub that can grow in pots, and you may even see it trimmed as miniature Christmas trees during the holidays, but most varieties do best in the ground in full sun. There are a few varieties that are freezing winter hardy, and it took several years for us to find one that took for us. We planted Arp, which is hardy down to -10 degrees F, but also look for Hill Hardy or Dutch Mill. Some other varieties survive below freezing temperatures, but many others are tender and do not. We love sage for roasting meats and vegetables and flavoring gravy. It’s also delicious fried or chopped and added to risotto. And the purple blossoms are beautiful in the garden. 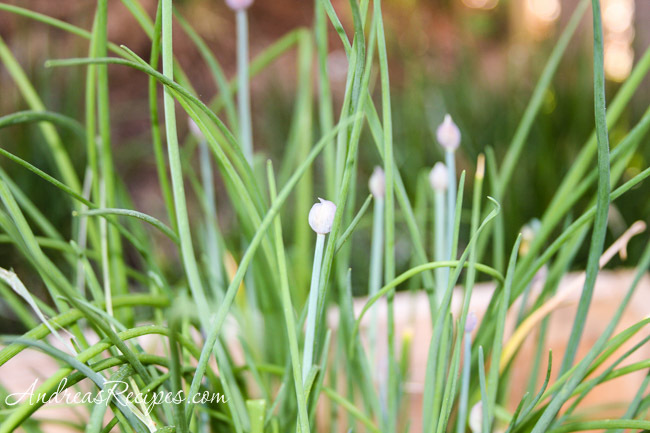 Chives have a pleasant onion flavor and reliably come back year after year. They also produce delicate blooms, for a color bonus in the garden. Plant chives in a partly sunny to shady location. More signs of life in the garden. Garlic chives have popped out. Garlic chives have a slightly garlic flavor as the name indicates, and a flat leaf shape compared to the common chives. Plan them in partly sunny to shady locations. Delicious in Asian recipes. 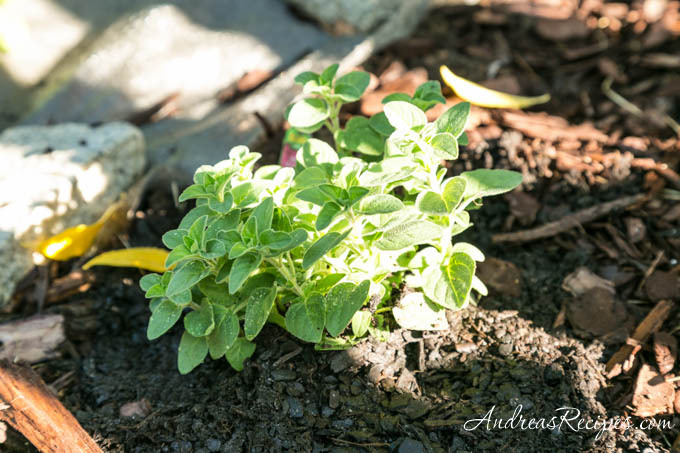 Oregano is a hardy herb with a mounding habit, and it spreads easily. Plant it where it can get full sun, and snip off stems as needed. 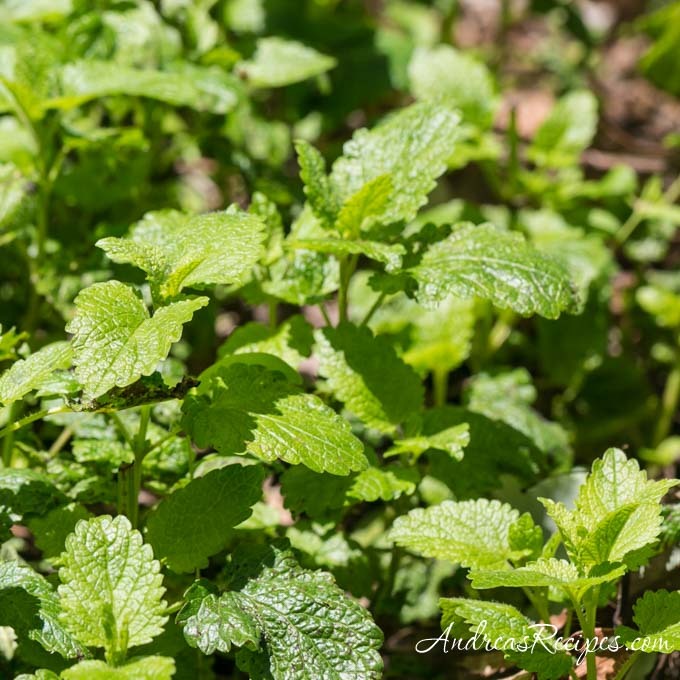 Lemon balm has a pronounced lemon scent and flavor, and is useful in teas and baking. The summer flowers also attract beneficial insects. It is a member of the mint family, and grows easily in full sun and vigorously spreads each year. Grow it in pots or in the ground, but be prepared to dig up if it spreads outside its territory. 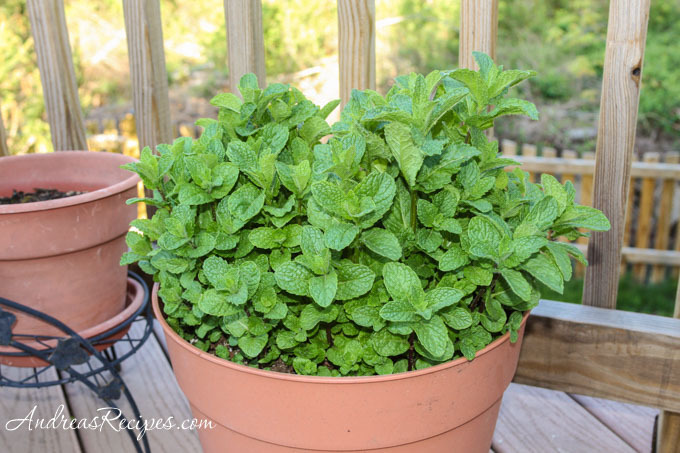 I keep a pot of mint on the deck and use it frequently throughout the year. It’s fantastic for beverages, especially tea and cocktails, and it adds wonderful flavor to tabbouleh and other dishes. There are many varieties, and I like the sweetness of spearmint. Mint spreads by rhizomes running underground, and it establishes very quickly, which is why I grow it in pots because I don’t want it everywhere in the garden. I also keep the flowers trimmed back to prevent seeding and encourage leafing. Great post!! I really need to get some things planted this year and I never think about it until the weather is warm – thanks for the reminder!